Flavorful marinated flank steak is served up in sizzling flair with traditional garnishes and cilantro leaves. In a pan or bowl, add olive oil, lime juice, Knorr® Base Caldo De Tomate and minced cilantro. Mix well. Trim the steak of excess fat and silverskin. Place the steak in the marinade and marinate for 6 hours or overnight. Take steak out of marinade. Preheat grill. This can also be done in a sauté pan but grilling offers a lot ofconplext flavor element. Clean the grill and spray down with a little pan spray or wipe with oil. Season flank with Knorr® Base Caldo De Tomate. Grill the steak to medium rare. Let rest and slice. Once sliced, baste with lime juice. 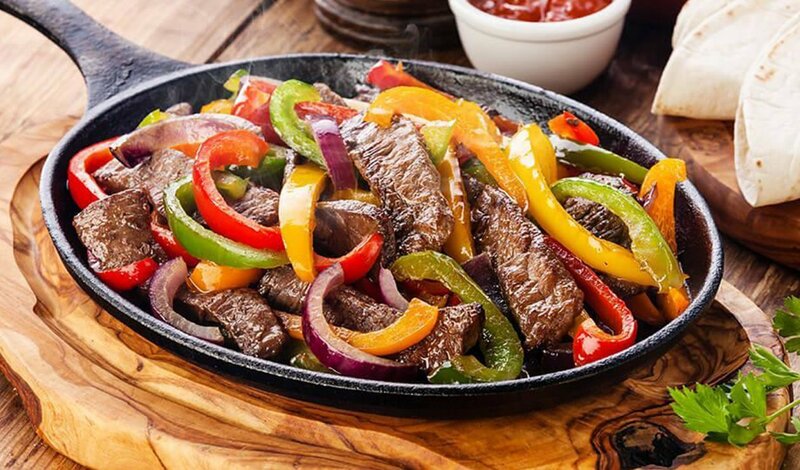 Place 4 ounces of meat on a plate or sizzle platter. Next to it, add radishes, grilled onions, 1 grilled jalapeno and 2 corn tortillas. Top with cilantro leaves and serve.